Here's a guide on how to upgrade your Pets in the multiplayer online battle arena - mobile game BarbarQ. An IO mobile game, that is available to download from the App Store and Google Play. 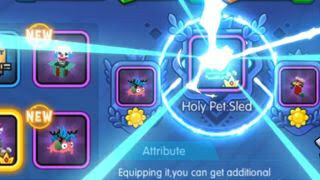 - All pets can be used as your Main, just unlock and upgrade their slots to give them up to 2 Attendant Pets. - Overall, with the right combinations of pets, these main pets can really enhance your characters and winning chances. - Pets that can be equipped to your Main Pets, varies per pet and class. - Click on the "Put In" option to check which pets are available for that Main Pet. - Your Main Pets will get the ability of their Attendant Pets, depending on their current slot upgrades. - Nope, equipped pets can be replaced without any fees or penalties. - This depends on your main role in your team, or your current style for playing most of your characters. - Check the pets that is also available for your preferred Main Pet to become Attendant Pets, this will give you a clue if they are useful for you or not. - Also check if you can gather all requirements for upgrading their slots. - Pet abilities changes a lot in this game due to balancing, so I can't really give a concrete info about this. You may also check what other players are commonly using during battles. - Gold: Usually obtained from various in-game events and freebies, buy from the Shop (through boxes if avaialble), Season rewards, and more. - For Class C, D and E Pets, you can unlock and upgrade their slots by using Gold only. - Lower Classes will require fewer Gold per upgrade. - Pet Souls: Buy them from Shops, or gather from various Events like Season Rewards, Arena Chests, Dark Adventure, and many more. Note that some Pets are rarer than others, so check which Pets are easy to farm or complete if you are a F2P player. - Required only for upgrading Class B or higher Pets. - Lower Classes will require fewer Pet Souls and Gold per upgrade. - Bonus: The % of it's ability that can be absorbed by your Main Pet.